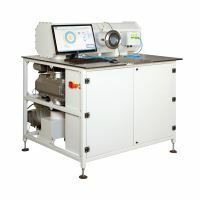 The FMTB test bench series are compact test benches using air under atmospheric conditions. The test bench is designed to calibrate to a high level of accuracy in the shortest possible test time. The FMTB is equipped with high quality sensors and instruments whose measurement results are traceable to international standards. The FMTB series units are fully automated and by reducing thermal expansion effects, the smart control makes it possible to calibrate meters in a very short time. Using a multi-channel data analyzer with built-in clock it is possible to sample and collect data with a very high accuracy. The Flow setting is performed over a frequency regulated blower in combination with regulation valves that enable fast and accurate flow regulation over a wide range at any set point. The FMTB is pre-calibrated by FMG and ready for use. It is suitable for calibration of diaphragm meters, rotary gas meters, turbine gas meters and ultrasonic gas meters. The FMG series of calibration centre is designed for testing and calibration of all commonly used gas meters such as diaphragm, rotary, turbine and ultrasonic gas meters. The FMTB series can be operated manually, automatically and/or remotely. The FMTB series uses state of the art technology to assure the best performance with a minimum of maintenance and operational costs. Keep up-to-date with the latest company news, research highlights and benefits.